Its core audience is old, white conservatives. It is accused of broadcasting an archaic, Mad Men-era view of the world that alienates women and minorities. Its future leaders know it needs to change, and yet time and again it retreats to the status quo. The Republican Party... or The Fox News Channel? As Fox News looks to replace Roger Ailes, the chief executive who stepped down last week amid sexual harassment allegations, it faces the same predicament the Grand Old Party has been wrestling with for years: Does it move toward the center, abandon its most extreme voices and seek to broaden its appeal, or does it stick with the core supporters who are responsible for so much of its success? "No party and no media entity wants to end up being to millennials what the Oldsmobile came to symbolize to Boomers about their parents generation," Chris Lehane, a political consultant who served as a top aide to President Bill Clinton, said of both the GOP and Fox News. At the same time, veteran media analyst Jeff Greenfield observed, a dramatic shift "surely runs the risk of alienating the network's base." If Fox News could keep that base forever, it wouldn't have anything to worry about. Last year, it was second only to ESPN in primetime cable ratings. More importantly, it is such a staple of cable news that it commands huge subscriber fees, which account for more of its revenue than advertising. So long as the network can keep up its current audience numbers, and so long as cable providers — and, more importantly, those providers' customers — see it as something they can't live without, it will be in good shape. Problem is, Fox can't keep this audience forever. Its core audience is old, white and conservative, and America is becoming more multicultural and progressive. While Fox News was number one among cable news outlets in the all-important 25-to-54 year-old demographic last year, the demo only accounts for 19% of its audience. The median age of the average primetime Fox News viewer is 68 -- five years older than MSNBC, and nine years older than CNN. Meanwhile, 92% of Fox News viewers are white, according to Nielsen. By contrast, MSNBC's audience is 67% white, while CNN's is 73% white. Fox succeeds now because there are more Republicans than Democrats among white men of the Silent Generation (age 69-to-84). But among Hispanics, college-educated women, Latinos, blacks, Asians and millenials — in other words, the future — the Democrats have a major edge. 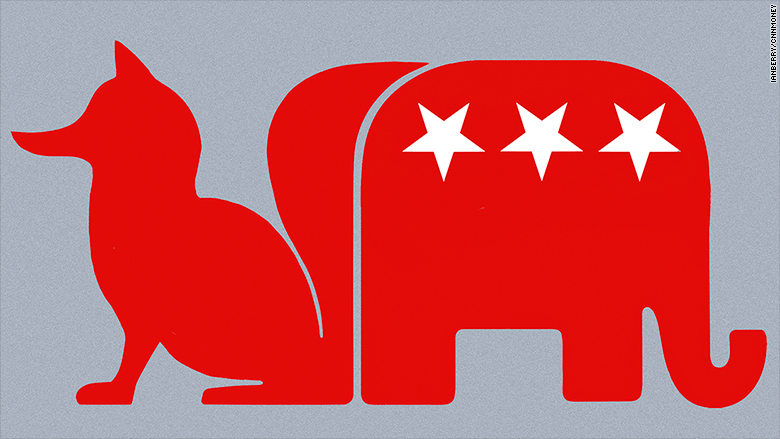 But of course, political parties and cable networks are very different beasts. "A party needs half of the country's voters (or at least a plurality) to win. For Republicans, the steady 2% drop in the white share of the electorate is a ticking time bomb," Greenfield noted in an email. "But a cable news network can flourish for an awfully long time with a sliver of the whole." Moreover, Fox News' revenue is driven not just by ad revenue (which fluctuates with ratings), but by the subscriber fees, the cost cable providers pay to carry a channel. At roughly $1.50 per cable subscriber, Fox News has some of the highest fees in cable, trailing only ESPN and TNT. "Even if advertisers don't like an older demographic, Fox's subscriber fees will still generate huge profits," Greenfield said. But long term, Fox can only maintain its subscriber fees if it maintains an audience, and many think the old guard at Fox News isn't keeping up with the pace of demographic change. "A 'Mad Men' back to the future orientation is simply going to be a path to extinction," Lehane said. "I think the next generation at Fox gets this and are clearly thinking about where the world is going." The next generation at Fox is James Murdoch, Rupert's 43-year-old son, who was named CEO of 21st Century Fox last year. In the GOP analogy, he is the Paul Ryan figure. Like Ryan, the 46-year-old Republican Speaker of the House, Murdoch is said to believe that his organization needs to reign in the divisive rhetoric and broaden its base. Still, both Murdoch and Ryan recognize that their core audiences are essential to the success of Fox News and the GOP, respectively. Because of them, Fox News is the highest-rated cable news network in the country, bringing in $1 billion a year in profit. Because of them, Republicans have won the Senate and expanded their grip on the House. The incentives of money and votes have made it hard for either organization to resist the lure of easy short-term profits in favor of holding out for long-term gains. Following Mitt Romney's loss in the 2012 presidential campaign, the Republican National Committee made a strong case for expanding outreach to Latinos. In 2016, it nominated a presidential candidate who referred to Mexicans as criminals and rapists. Meanwhile, Fox News continues to serve as a home for the likes of Bill O'Reilly and Sean Hannity, and for rhetoric that can alienate younger voters, women, Latinos, African-Americans and others. At the same time, the candidates on the short list to replace Ailes all appear to be — like the top executives at almost every major American media company — white men: executives inside the network like Bill Shine and Jay Wallace; and outside, like CBS News President David Rhodes or leaders from the Murdoch's Sky Broadcasting empire. "Fox is stuck with the same problem and same instincts on solutions as the GOP," said one prominent digital media executive. "It's run by white men, for white men, and the kids know that needs to change just like Paul Ryan knows the GOP must change. But the money will pull them to the white man solution one more time, making its problem with minorities, women, and others harder to fix long-term."